The U.S.-led coalition in Iraq dropped far more bombs during the sunset of Bill Clinton’s presidency than under President George W. Bush in the run-up to war in Iraq, RAW STORY has found. The details of the bombings, provided by the British ministry of defense to parliament in February 2002, markedly revise a picture painted by critics of Bush’s airstrikes and that of a piece RAW STORY carried last week. The nature of the strikes differed; Clinton’s bombings were part of what some dubbed a “war of attrition,” an attempt to degrade Hussein’s hold on power without resorting to full-scale war, whereas Bush’s bombings appear to have been part of a concerted effort to clear the way for a ground invasion. A sweeping attack, conducted in January of 1999, rained down 25 missiles on Iraqi soil, killing civilians. Clinton said the attack was in response to four planes violating the no-fly zones. Clinton and British Prime Minister Tony Blair authorized air strikes on more than 100 days in 1999, sometimes several times per day. The bombings were ostensibly in response to Hussein’s refusal to allow UN weapons inspectors into the country, though critics alleged the move was aimed at deflecting attention from impeachment. In the first three months of 1999, U.S. led-forces bombarded Iraq with 241,000 pounds of bombs—just shy of the 253,000 pounds dropped under President Bush in the eight months leading up to the final UN resolution before the war. By August of 1999, American and British pilots had fired more than 1,100 missiles against 359 targets—that year alone. 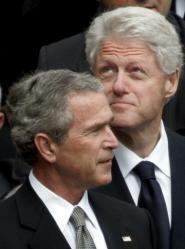 RAW STORY has found that Clinton, like Bush, authorized a change in strategy with regarding to attacking Iraqi sites. Defense Secretary William Cohen told reporters in March 1999 that he’d changed the rules of engagement to allow coalition pilots to attack Hussein’s communications infrastructure. The British said they had no figures on how often coalition craft were attacked in 1999, but alleged that Iraqis had violated the Southern no-fly zone 53 times. By contrast, Iraqis violated the zone just eight times in the eight months before President Bush sought a stiffer resolution from the UN to build a case for war. In 2000 and 2001—over the course of 24 months—the British reported 280 Southern no-fly zone attacks on coalition forces, along with 18 airspace violations. Comparative attacks in the eight months before the November 2002 UN resolution totaled just 41. London Sunday Times reporter Michael Smith, who revealed the secret Downing Street minutes, a transcript of a high-level meeting between British and U.S. forces in July 2002 at which British intelligence said intelligence was “being fixed” around the policy, sees a difference between the Clinton and Bush bombings. The Downing Street minutes indicate that the U.S. had already begun “spikes of activity” as a prelude to war, a phrase also employed by General Tommy Franks, who led the Iraq invasion. “The legality of this is disputed but the [British] Foreign Office legal advice makes clear that both Britain and the US believed it to be legal,” the veteran war correspondent continued. But “spikes of activity to put pressure on the regime is illegal plain and simple,” he quipped. “The no-fly zones were certainly not put there to put pressure on the regime, for which read provoking the regime into giving the allies an excuse for war." Bush, unlike Clinton, was skeptical of any Iraqis’ attempts to allow weapons inspectors back into the country to enforce the UN resolution. "There is reporting this morning that the Iraqi regime has asked the U.N. to have a discussion. It should be a very short discussion," Secretary of State Colin Powell told the Senate Foreign Relations Committee in March 2002. In what some saw as a bid to provide cover for war, the U.S. subsequently engineered the removal of Brazilian diplomat Jose Bustani from the Organization for the Prohibition of Chemical Weapons, the group which enforces chemical weapons bans. Under Bustani, the group oversaw the destruction of two million chemical weapons and two-thirds of the world’s chemical weapons facilities, and raised the number of signatories from 87 to 145. In the months that followed, Defense Secretary Donald Rumsfeld quietly shifted policy towards Iraq to allow for surgical, pre-emptive airstrikes months before any attempt to seek UN or Congressional approval for the use of force. “I directed it,” Defense Secretary Donald Rumsfeld told reporters at a Sept. 16, 2002 Pentagon press briefing in response to questions about the rising tide of airstrikes in 2002. "I don't like the idea of our planes being shot at. We're there implementing U.N. resolutions... And the idea that our planes go out and get shot at with impunity bothers me." In his autobiography, American Soldier, retired U.S. General Tommy Franks, who led the 2003 invasion of Iraq, invoked the “spikes” phrase—as far back as 2001. "I'm thinking in terms of spikes, Mr. Secretary,” he wrote, referencing a conversation with Defense Secretary Donald Rumsfeld in December 2001, “spurts of activity followed by periods of inactivity. We want the Iraqis to become accustomed to military expansion, and then apparent contraction." Ron Brynaert contributed research for this article. Originally published on Tuesday July 5, 2005.